There are two types of patterns -- those for the new knitting techniques and, of course, project patterns. Both types are packed with detailed information on construction, the techniques, some tips and both charts & tables. PDF file with built in links to online tips, photos and more details. Online photos on Photobucket.com for clearer pictures and work in progress photos. Chart files you can download separately. 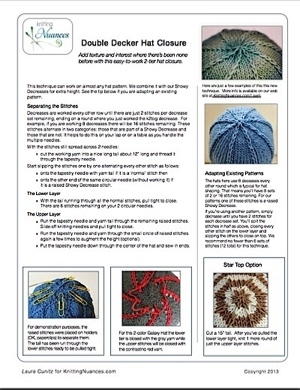 Each design is means to show you how to use our new knitting techniques. That means every detail is considered up front from the cast on, construction, shaping and bind off. We may ask you to use five rows for the cast on. It takes more time but the results are both beautiful and practical. This is my chance to chat with you about the pattern; giving you an overview of the project steps, any interesting or different construction concepts, some tips I learned along the way, and ideas on how you might use some of the techniques in this pattern in your other projects.